Stickers and filters are coming to Tumblr, starting Tuesday. The blogging network announced that more than 100 stickers, as well as color filters, began rolling out at 11 a.m. ET to iOS and Android users, and the rollout will continue through Wednesday. Tumblr added that new stickers will be introduced every month, citing as examples Valentine’s Day and Black History Month in February. Stickers can be accessed on Tumblr by creating new photo or GIF posts and then pressing on the face icon at the bottom of the screen. The wand icon on the bottom of the screen brings up color filter options. Where are the stickers??!? Make a new photo or GIF post and look for this face at the bottom of your screen. Push it. Now you see stickers. Can I combine stickers with text? Yup. We put assorted speech and thought bubble stickers in there for that reason exactly. Besides posts, where else can I use stickers? If you make a GIF through Tumblr messaging in the application, you’ll have an opportunity to cover it with stickers first. And if you use an iPhone, Tumblr has an iMessage app that you can use to make GIFs and text them to your contacts. Stickers are a part of it now. Are there more stickers coming? Yep! If you don’t see your favorite object/word/abstract concept represented here, stay tuned. What about those filters you mentioned? I want to totally scorch this GIF I’m working on. Oh yeah, the filters! We threw in a few filters. They’re intense. Tap the magic wand and enjoy. 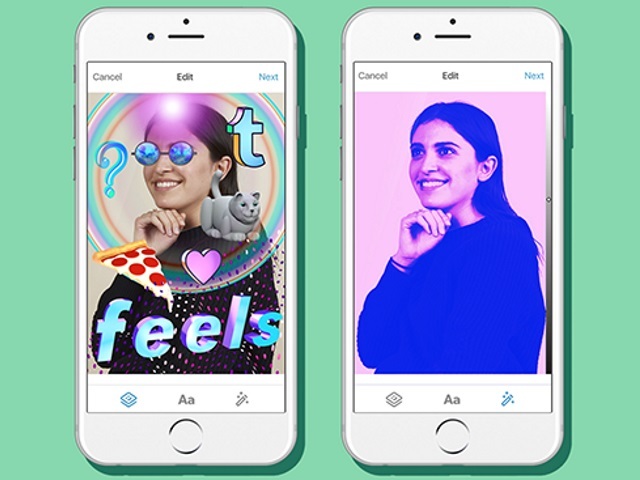 Tumblr users: What are your initial thoughts on the introductions of stickers and filters?